These beautiful pieces were made by Cake Artist Jennifer from flickr (with her permission to share.) 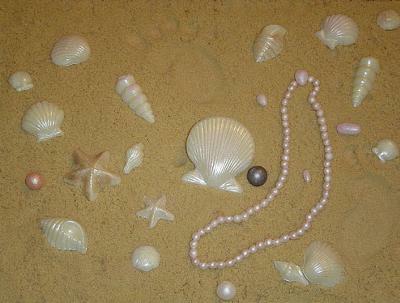 She made the shells out of white chocolate and then brushed them with Super Pearl Powders. The sand is Brown Sugar. Wow, it semms like it took a lot of time and dedication. Ups to you!